Uglyworld #955 - Toto's Secret Cookie Stash, originally uploaded by www.bazpics.com. 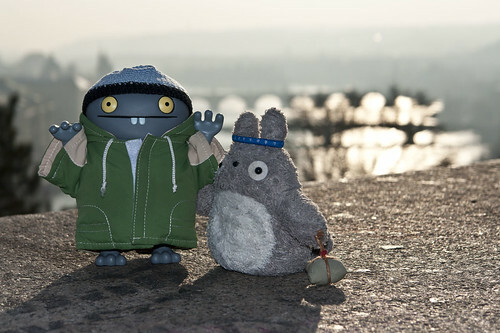 Yesterdays when I visits Prague, I wasn'ts just there on my owns as Totoro decideds that he wanteds to sees the city too. We both knowed it was goings to be freezings cold so we dresseds ourselves up in our warms gear in advances, I hads my matchings jumper and hat with my rains jacket (completes with thermals lining) and Totoro wore his favourites fur coat and specials headband which he said "looks cool and keeps my head warm too). We is standings way ups high on one of the hills which surrounders the city here, and in the backgrounds you can hopefully sees the outliner of Charles Bridge which is fulls of people wanting to draws you and sells you stuff, I thinks there was more peoples on the bridge than I has finded in the whole city! Toto was nice enough to brings along his "secret stash" package (which I must says he holds on to very tightlies), and insides this he had lots of awesomes cookies for us to munch on all day. I hads a great time explorings the city of Prague, and hopefullies will get to go backs there sometimes in warmer weathers!